It's been a while now since we reviewed Gigabyte's first X58 motherboard and one which I was very impressed with, the EX58 UD5. Since then we have reviewed a number of motherboards from the ever popular Asus P6T to the High Performing DFI T3eH8. None of those boards however, could match the all round abilities of the UD5, especially for the price. So then, what can the UD4P, Gigabytes latest offering bring to the table? Well, for a start it is cheaper than the UD5, it's still a feature packed board and as we will see, it has only forsaken a few features of the UD5 which you may or may not miss. Priced between the UD5 Extreme and the budget DS3R, the UD4P is the latest performance X58 motherboard based on Intel's Skt1366 configuration and one of seven motherboards hailing from the Taiwanese company. 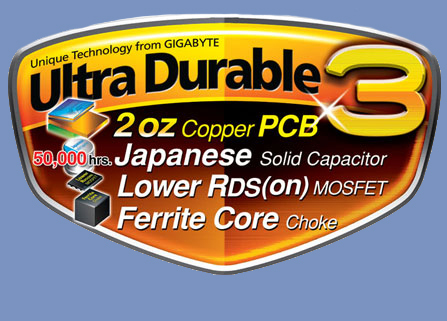 All of the boards from Gigabyte are cut down versions of the range topping UD5 Extreme. The UD4P has a slightly different PCIe configuration, sporting 2x16 PCIe ports which drop down to 1xPCI16 and 1x8 when the third (orange) 8 speed PCIe port is used. The UD5 however retains the full 16 lanes of PCIe 2.0 goodness when the third slot is used. In contrast the UD3R has 2 full size PCIe ports so does not allow 3-way SLI/CrossfireX. The UD4P also has less SATA ports than the UD5 but as it already has 8 SATA ports only the storage hoarders should be concerned. The UD4P does however have a feature which the UD5 does not and that's the Ultra TPM encryption capability. The TPM (Trusted Module Platform) allows users to secure their files, preventing any unauthorised access without the keys stored on the USB stick. Being much more secure than software based encryption, TPM is perfect for users who might have what some might say 'sensitive information' on their PC. These keys can also be backed up in the BIOS should you be the forgetful type. Once the key's are stored on the USB stick they are then erased from the PC preventing anyone from accessing your protected files without the key. Simply unplugging your USB key locks up the files and renders them unusable until the USB key (and therefore the keys) are re-inserted. Thankfully Gigabyte include full instructions for this procedure with a separate manual. Being part of the Ultra Durable range, the UD4P features quality components which provide better cooling, greater efficiency and enhanced signal quality. This, along with lower EMI (Electromagnetic Interference) provides greater stability allowing for higher overclocks. The EX58-UD4P is the latest high performance X58 Series motherboards of GIGABYTE, designed from the ground up to unleash the awesome power of Intel’s new Core i7 processors. Equipped with a host of new features including the new QPI interface, 3 channel DDR3 support, 3 Way SLI™ and CrossFireX™ support, Ultra Durable 3 technology and the industry’s most extensive range of overclocking features, the EX58-UD4P is bringing excitement back into the high performance motherboard industry. An Impressive specification to say the least. Raid RAID 0, RAID 1, RAID 5, and RAID 10 is available on the Intel controller and Gigabyte have also managed to cram a floppy port on the board for good measure which is a rarity these days. This, along with dual PS/2 ports should ease the monetary burden of upgrade for those clinging to yesterdays hardware.